Luxury car manufacturer Bentley and artist Sir Peter Blake have created an eye-catching car to be auctioned for hospice charity Care2Save. When local hospice St Luke's, with which Bentley Motors has a long-established connection, launched a new trust to tackle the need for palliative care globally, Bentley Motors decided to help by doing what it does best - building cars. 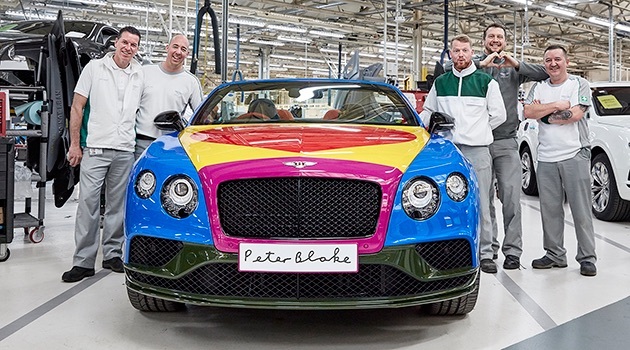 Working with artist Sir Peter Blake, the godfather of British Pop Art, Bentley colleagues have produced an extremely eyecatching example of the company's Continental GT model. The highly customised car will be auctioned by Bonhams at the Goodwood Festival of Speed on June 24. The proceeds will go to the Care2Save Charitable Trust, set up by St Luke's to raise awareness and funding for end of life care in parts of the world where it is often neglected and underfunded, as well as in the UK. Since St Luke's opened just up the road from the firm's Crewe headquarters, Bentley employees have volunteered countless hours of their time to raise money and give hands-on help with renovations and gardening. Over the years, St Luke's has helped the families of several Bentley colleagues when they have been ill. When the hospice revealed their concerns about palliative care globally, Bentley saw this as a way to engage its staff and the wider world with a cause that resonates very strongly with the people at its Crewe HQ. Sally Hepton, Director of CSR at Bentley Motors said: "Sir Peter Blake’s Bentley is a Bentley with a heart (quite literally, Sir Peter’s iconic heart motif is the standout feature of the car), for us it’s been the natural progression of a relationship between two organisations at the heart of the community. We hope this car will help Care2Save change lives in communities worldwide in the same way our colleagues’ fundraising and volunteering make such a difference locally."